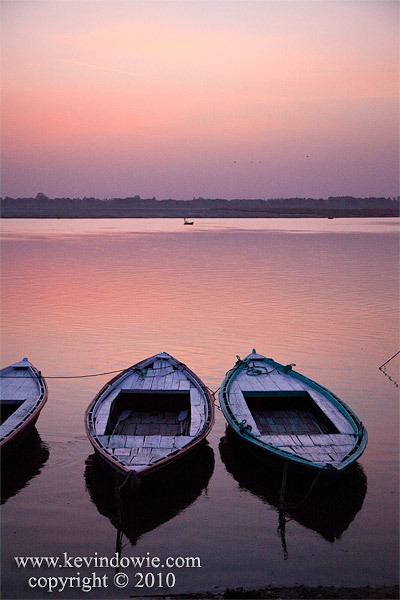 Another image from my travels to India earlier this year, this time boats at sunrise at Varanasi on the River Ganges. As the title suggests, it was very early morning with some pleasing colour in the sky being reflected in the water. I decided in this instance to pump up the colour saturation a bit in post processing using Adobe Lightroom. My typical image processing is to enhance the clarity, colour saturation and vibrance very slightly. In fact I noticed after a while that the settings I was using in Lightroom, to get the look that I liked, were so consistent that I now import my images with a development preset applied as a starting point for any further processing. Whilst on an image by image basis, I may go for different effects eg: monochrome or toned monochrome, the preset accounts for probably 80-90% of my finished photographs. This leads to the question of whether a photograph is purely documentary or whether it is impressionistic of the scene as it’s remembered. Whilst I appreciate subtlety in colour processes, in this case I’ve moved towards a more obviously impressionist final result. In the coming days I’ll present another image from the same location where the result will be well and truly into the “impressionist” category. Canon 5D Mark 2 with 24-105mm zoom lens at 50mm and F4.0, Shutter Speed 1/320 second at ISO 4000.